Mention the south of France, and what images come to mind? You can bet your boots that the words conjure up glamour, wealth, sunshine, beaches, palm trees and ritzy hotels. All this is certainly part of the south of France story, but it is not all there is to it. France is a vast country, and even within the areas that we call the south of France there is huge diversity, not just of landscapes but of lifestyles too. Consider, for a moment, the southern stretch of France, from say, Bordeaux (Bordeaux Property Guide) in the west across through the Lot (Lot Property Guide), the Lozère (Lozère Property Guide), the Ardèche, and the Drôme through to the Hautes-Alpes in the east. Then look southwards from each of these departments, taking in all of southern Aquitaine (Aquitaine Property Guide), the Midi-Pyrénées, Languedoc-Roussillon, Provence (Provence-Alpes-Côte d'Azur Property Guide), the Riviera and the southern Alps. The terrain we are covering includes the gentle vineyards of Bordeaux, the wild surf beaches of the Atlantic (The French Atlantic Coast from Biarritz to Southern Brittany), the craggy Pyrénées, hot Mediterranean beaches, the lavender fields of Provence, the gorges of the Ardèche and the mighty Alps... and that is only scratching the surface. France's south-west is a very popular area with British holiday makers and property seekers these days, and there are many places within these regions that offer not only a wonderful way of life but also properties at prices far lower than you will find further east. The region of Aquitaine, with the wine wealthy city of Bordeaux in the north and the trendy surf resort of Biarritz (Biarritz Property Guide) in the south, offers some irresistible possibilities for property seekers, although these coastal and well known places do tend to be expensive. Further inland, looking to the rural parts of Midi-Pyrénées (Midi-Pyrénées Property Guide), there is plenty of affordable property still to be found, although property in Toulouse (Toulouse Property Guide) and its near neighbours is highly priced and sought after. Down near the Spanish border, in Catalan France, there are some delightful villages. The views of the eastern Pyrénées and the Mediterranean beaches in southern Languedoc-Roussillon (Languedoc-Roussillon Property Guide) combine to produce some of the most spectacular scenery in Europe, as well as offering fantastic sporting possibilities ranging from skiing to scuba diving (Sport in France)! Here also you can follow the mystical trail of the Cathars, cruise down the lovely Canal du Midi and eat cassoulet until you burst... and, of course, much, much, more. The south-west is, in short, all things to all men. What it doesn't have, however, is the sophistication of the Riviera or the Alps. In terms of property, whilst parts of the south-west have always been popular with foreign buyers (the Atlantic resorts and Bordeaux), much of this region was relatively undiscovered until recently. Its popularity is rapidly increasing, however, with prices in hot pursuit as always. Best for bargains are (at the moment!) the Ariège (Ariège Property Guide), the Gers (Gers Property Guide) and the Lot. Most expensive are Bordeaux, Toulouse and the coast. If you are interested in this south-western area there is greater detail to be found our article dedicated to this area alone South-west France Property. Between the south-west and the Riviera there lies a very lovely and ecologically interesting stretch of coastal land. It is interspersed with typical seaside holiday towns such as Narbonne (Narbonne Property Guide), pretty little fishing towns like Gruissan, and the unique flat marshlands of the Camargue, where the tough and beautiful white horses roams free and where the mosquitoes pack a bite that could fell one of the famous black bulls of the area! Ancient towns such as Arles, with its bullring and history that includes being the beloved haunt and inspiration of Van Gogh, are so full of charm that you may decide to brave the mosquitoes and simply stay... for ever. Keep heading east along the coast and you will find France's second city, Marseille (Marseille Property Guide). Continue along the coast towards the Riviera, and you will find the heat rising as will be the property prices. Toulon (Toulon Property Guide) is a lovely city, and also in this part of coastal Provence are beautiful tourist spots like Bandol, where the sea has the intense blue of a sapphire, and seems even more desirable under the burning summer sun. The hills that form the backdrop to the bays and beaches of this part of France rise steeply and darkly, clad with tall pines offering a cool respite for walkers and riders. 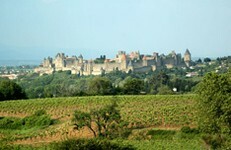 Ever present here too, are the vineyards (French properties with vineyards). This is a great rosé country (don't take my word for it, try it!) and the Bandol appellation label can command good prices. The most south-easterly tip of France is commonly referred to as the Riviera, although there is some debate about where it begins and ends. What is agreed, however, is that Nice (Nice Property Guide) is its capital city, and that the department of the Alpes-Maritimes (06), is the place to head for if you really want to star spot (Alpes-Maritimes Property Guide). Being so close to Italy, Italian influences are very visible here, and the architecture of cities like Nice clearly reflects Italian style and ideas. Yes, property along the coastal strip is often overpriced and the area overpopulated in the season (though there are bargains to be found if you know where to look - French Riviera Property - an insider's guide) but it has an ambience that will continue to make it one of France's most popular destinations. Cannes (Cannes Property Guide), with its film festival, Saint Tropez (Saint Tropez Property Guide) with its memories of the young Bardot, the regal exclusivity of Monaco (OK, not strictly France, but right next door! ), the hillsides above the towns with their walled mansions that overlook the sparkling bays and colourful marinas... these are places that have a real buzz about them, and where property will always be desirable. Property here would be best for whom? The movers and the shakers, the fashion devotees and film buffs, the social animals and the people watchers. The young, the old, the in-between... if there's a penny or two in your pocket and you want to live life to the full you should find something to keep you happy on the Riviera! Go north, young man... and head for the hills, or the Alpes de Haute Provence, and the Hautes-Alpes to be precise. These are the departments that lie north of the Riviera, and they are, as their names suggest, mountainous. In the Alpes de Hautes Provence (Alpes de Haute Provence Property Guide) you can find property in some of the most beautiful scenery in France, with contrasting landscapes of mountains and gorges lying virtually alongside typically Provençal villages and lavender fields. It is a land that attracts adventurers, as here they can escape the madding crowds who flock to the coast, and simply indulge their passion by pitting their wits and skills against the challenges provided by Mother Nature. There are rushing white waters perfect for rafting and kayaking, great swathes of open land and forest paths just calling out to horse riders and walkers, rivers and lakes (French Properties with Lakes), rock faces to climb and trees to swing through. The area is bursting with flora and fauna that thrive on great climate and fertile earth. The Hautes-Alpes (Hautes-Alpes Property Guide) can rival the Alpes de Haute Provence for spectacular scenery and sporting opportunities too. Another area that is made for those who prefer nature's glories from those created by man, this department also boasts some great ski slopes (Ski Chalets for Sale in France), with Briançon offering no less than eleven runs for skiers to enjoy. Less hectic and less expensive in terms of buying property than the better known resorts of the Savoie and the Haute-Savoie (Savoie Property Guide), the Hautes-Alpes are definitely worth considering if you dream of a life in the mountains. If these two departments don't always get the credit they deserve, it isn't necessarily a bad thing. Once you have discovered these glorious areas you might be well advised to keep them to yourself! The Drôme (Drôme Property Guide) has many of the delights of Provence, yet without the crowds and the prices, while the Ardèche (Ardèche Property Guide) is spectacular with its gorges and canyons and a rural lifestyle that hasn't yet caught up with the modern world. The Ardèche, in particular, is the place to look if you hope to find a property to renovate on a tight budget (House Renovations in France, Building or extending property in France). There are still many excellent prospects available here and prices have yet to hit the levels seen in most other parts of the south. Owning a property here perhaps would be best suited to those who have an abiding love of the rural heart of the south of France. So, there you have it. A whistle stop tour of the south of France. If you are looking for the perfect place for you, maybe this will have been of some help. On the other hand, words can only ever be a rough guide... do yourself a favour, pack the sun lotion, book a flight and discover this gorgeous part of France for real.